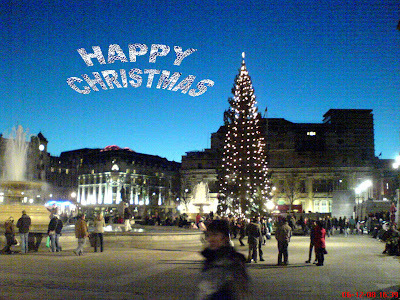 I think that my message that Photoshop is really quite simple has not got through. So. 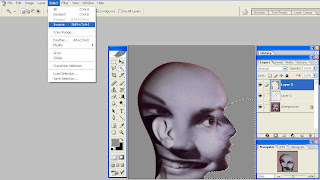 I am going to repeat myself but to be sure that you get the most out of using Photoshop the first thing you need to know is how to open an image, the second is how to save an image and third how to use layers. When the program has loaded you can either drag an image from a folder or go to "File" "Open". If you make any alterations to the image you might want to save it for future use. It depends on what the use is going to be - but for example if you have changed an image but dont want to change the original saving as a photoshop ("psd") file is best. This fil;e is uncompressed and saves any layers you might have produced. Alternatively - if the image is for the web it is best to use "File" "Save for the web" where you have several options for saving in different web friendly formats. Most images can be saved as jpg files and you are given the option to change compression rates and given predicted loading times for various compressions. Bear in mind that the more an image is compressed the more that various compression problems occur. There is always a compromise position but you need to experiment to find it. 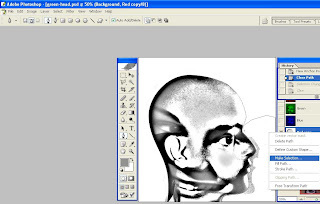 When you have open your image I would recommend that the first thing to do is to make a duplicate layer. 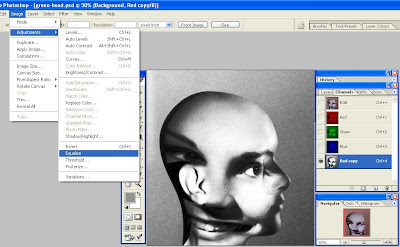 With the "Layers" menu open on screen a PC user can right mouse click on the background layer and choose the option to make a duplicate background layer. You can also click on the "Layer" tab on the top menu bar and choose Duplicate Layer from there. 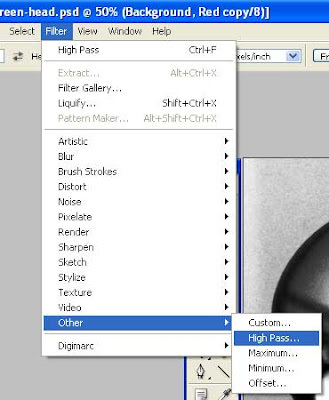 This layer should be the one that you edit so that you always have the original image to go back to. This allows easy access for checking progress or even going back and starting again. You can always go back a step by using the History panel, "Ctrl+z" on the keyboard or "Edit" "Undo". When you have learnt how to start using layers you will see how important they become. 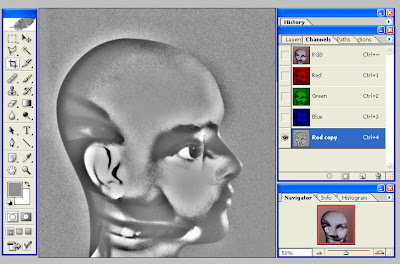 It is often the best option to create a new layer to retouching in. For example, you might want to do some "Red Eye" reduction. Doing this in a separate layer allows many choices of how you combine the image with the retouching. I will go into this later - if I get any response to this blog. In the Northern Hemisphere, at this time of year, it is difficult to get enough light to see by - let alone take photos. In the time of cameras that used film it was necessary to either light your subject or change to a faster film. If you went the fast film route you may have noticed that your images were very grainy making them slightly less appealing than the pictures taken with enough light to use a slower speed film. 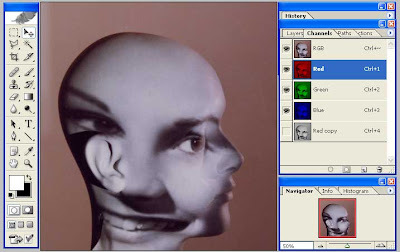 A simliar problem exists with digital technology. I will admit that film emulsions have improved over the years and are now much less "noisy" speed for speed than say 10 -15 years ago. This also applies to the digital format as new and improved methods of manufacture appear. So why the increase in noise with speed? Simply, in order to attain higher sensitivity, you have to have a larger light collector. With film this is simply larger light-sensitive crystals and with digital images this achieved by grouping adjacent image-forming sensors together. In both cases this has the effect of amplifying the light received at the image plane - thus increasing the effective speed. You can see then that this means a marked reduction in resolution and an increase in noise. This picture was taken with a Sony Erricsson Mobile Phone and I had no control over the chosen speed setting. This is the price you pay for taking the control away from the user. If I had a say in the matter I would have opted for a longer exposure time at a less sensitive setting. This phone, however, doesnt even tell you what the settings are, but, from experience, I can tell that the equivalent ISO setting would be around 800. If you look at the settings that can be adjusted on your camera you will see what the range is. The best - low noise - setting is always the lowest numerical value. Usually 100 iso sometimes less sometimes more but the lowest is the best. The latest Canon 5d mk2 boasts a low setting of 50 iso. In film terms this is the equivalent of Kodak's Kodachrome film (which was always regarded as the ulimate in image quality). If getting any image is the more important then the answer is to set your ISO seting to "auto" and let the camera work it out for you. I prefer to be in control (except when I am stuck with using my Mobile Phone). The reasons for choosing any setting will be governed by what the scene is that is being photographed. If you want fast shutter speeds - to stop movement - a fast (higher) iso number must be used but my advice is always to use the lowest practicable number for your iso setting to give smoother tones and less "grain" (noise). Excuses, excuses. I have been trying to find time to say some more about black and white. I have been turned on by colour photography from a very early age - it must have started with "The Wizard of Oz", you know that bit where it changes from black and white to colour. Well I am prejudiced I suppose. But, once you have selected black and white on your camera settings, thats it - a lost opportunity. Now then why not have the best of both worlds. You see, if you shoot with the black and white setting it converts the colour channels to the same grey scale. This prevents you making any changes to the relationship between colour tones. If, on the other hand, you shoot in colour you can make these changes mimicing the effect you would get if you had shot the subject using colour filters. 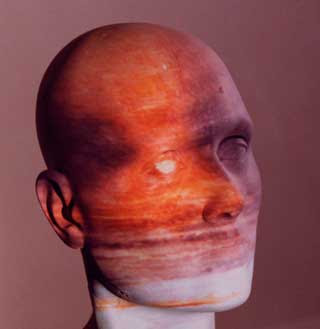 For example, a portrait of a male subject might benefit from use of a blue filter to make his skin tone rugged and weather beaten. Or a portait of a female subject might benefit from a red filter to neutralise skin tones making them softer. A landscape with a blue sky would benefit from a yellow filter to make the sky contrasty etc, etc. All these things can be done to an colour image - after the event, whereas in the days of film you had to use a filter at the time of shooting. I have done a compilation image of a pastoral scene that shows some of the possibilities. I have labeled these images to show how they were done. The two on the right show desaturated and the other is the Photoshop CS3 Black and White setting. 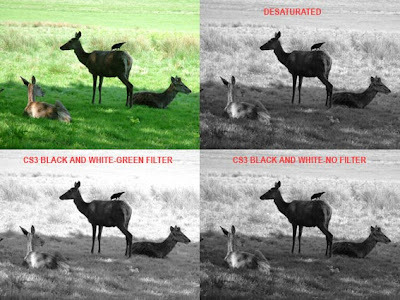 The black and white image on the left is how a green filter would look. Both Photoshop and Lightroom give you endless variations of filter changes and even the older versions of Photoshop can be used to provide an infinite choice by changing the colour relationships with "Levels" before desaturating the image. This is not the only way but with Photoshop one method of doing some change is as good as another (most of the time). I will try and update more frequently now I have found a subject for my black or white blog. 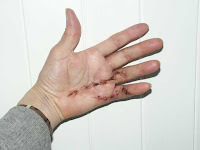 Today I had my stitches out so my digital hand looks a mess. The surgeon warned me that it would look as if a dog had savaged it and it does. I will put the image of it up as small as it will go and it's up to you if you click on it to see it life size. As a matter of interest I used the flash on the camera as available light made it look even worse than it is. After the surgeon had told me it looked ok to him i was taken away to have the stitches removed. The nurse who removed them thought I would be having physiotherapy so left it uncovered. When I checked in to physio they gave me an appointment for tomorrow. I had to come home with it as you see it. Not a pretty sight. I did not explain what the head thing was about. I was commissioned to do this picture -actually a series of pictures- for a record cover. In the event it wasnt used as it was considered to be too peculiar. I think the group was the Pogues but if my client ever reads this he might put me right. I have had a number of near misses in my career so I dont mind. I did get paid for it. The image on the right has a GMW Turner picture projected on it. This technique is quite easy to if you have all the necessary equipment - that is. 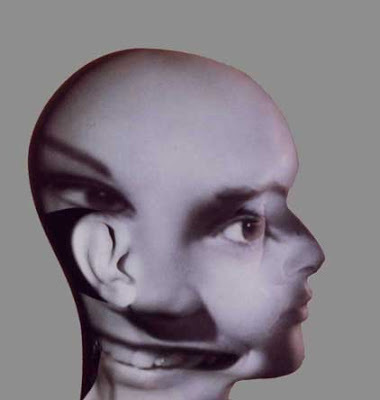 This one was done on old fashioned film the images having been copied from books onto transparency film and projected using a standard 35mm projector. 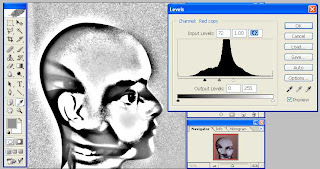 If you are forced to use a video projector then dont forget to use long exposure times to avoid any scan lines. Todays episode was going to be a simple cut-out. I started with a simple shape from an old portfolio picture of mine. A change in background would work well. I opened the picture in Adobe Photoshop and tried various ways of selecting either the background or the head but neither worked. Of course I could have gone right tound it with the lasso tool - but I find when you get to a corner the lasso generally lassoos itself through a bit you didnt want to go through. 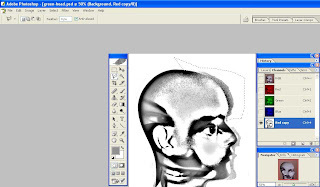 The other alternative is the pen tool to make a path that can be converted to a selection. Well- you folk out there don't learn from doing it the easy way so here is how I finally got to cut it out. The first problem I had was that the image was grainy and the edge was not very well defined. To make the edge clearer I chose to use a channel. I opened the channels folder and selected first the blue channel`nd made a copy of it. This wasn't quite right so I made a copy of the red channel - this was good enough. (Unhappily when I set photoshop up I elected to show channels in colour so this is a good reason not to as you can see straight away which channel is going to give the best contrast). The next step is to enhance the edge of the subject (it isn't really necessary here as the edge is quite clear - but you might need to do this sometime). This takes several steps. For the next step you need to clean up to the subject - I do this at fairly high magnification to see what is happening. 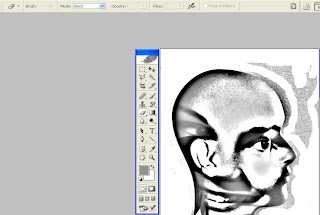 For the forehead I used the Lasso tool and for the nose, mouth and chin I used the Pen tool to make a path which I converted to a selection. Just click on your Delete button on your keyboard to clear a selection. When I had converted the path to a selection I addeed a layer and filled my selection with white. (When you convert a path to a selection you get the opportunity to "feather" curves which I did at 1 pixel). The next thing to do was to select the white backround I did this with the Wand tool. I realised that it was going to crop into the head so I made yet another layer and filled the background with grey (it could have any colour just that I needed to see what was going on. 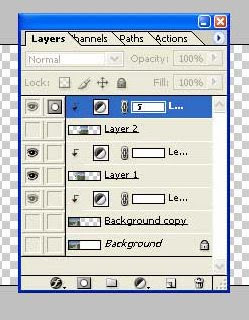 The "Layers" panel on the right is showing a "Background copy" - I did this to give me a transparent background. If you work directly onto the original Background layer the canvas takes on the colour of the background a solid tone of black, white or whatever you choose. I prefer to be more flexible. With Background copy you can reposition it, put a border all the way round and so on. If you click on the Background in the layer box and highlight it you can add a new layer which will become the base layer. This layer can be filled with a colour ot a pattern to make a border. If you want a border dont forget to cange both the width and height measures when changing the canvas size. I prefer to work with image files at the original size (full size camera original) as retouching is more accurate. When you have finished all the steps then crop and change pixel depth at the end. If your intention is to prepare an image for the web it doesnt need to be any bigger than a normal full screen size - about 1000pixels wide. If it is going in a blog it will be displayed smaller than that anyway, only going to full size when it is clicked on. I have spent over 40 years as a professional photographer covering most aspects of photography. I have worked for record companies and designers working for the record industry. My record covers range from ACDC to Mistletoe and Wine. I specialised in photographing paintings and Icons for well known financial houses and well known religious organisations. Established photographers used my services for specialised printing and film processing. My current work is mostly optimising images for the internet and looking after a few web sites as I have mostly retired from the photogrphic scene although I still have an occasional commission.